accuracy of +- 5 feet. your local authorities to allow them to track and recover the vehicle in real-time. for up to 6 months to allow you to view your vehicles past activity on the map. determine when and where your vehicle traveled throughout the day. travels, speeds, and idles. Mileage driven throughout the day is also included. in transit, time speeding, time idling, and time parked. by email and cell phone text messaging. vehicle tracks automatically every 15 seconds while moving. emergency occurs. Alerts notify you by email and cell phone text messaging. you by email and cell phone text messaging. and cell phone text messaging. from any PC, tablet, or smartphone. any PC, tablet, or smartphone. request to allow then vehicle to start again. fleet managers with a hands-free reminder of scheduled vehicle maintenance events. service reports provide a detailed maintenance checklist for your fleet. first movement of the day, long stop, maintenance due, and sensors. installation required, please consult your installer. 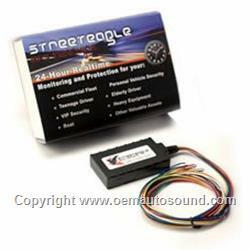 vehicle control from any connected device, StreetEagle helps you stay connected 24/7. that you can rely on us when you need it the most.